We love it when a company sneaks an Easter egg into an otherwise mundane program, especially when the little taps-the-nose trick does something wild and fanciful. 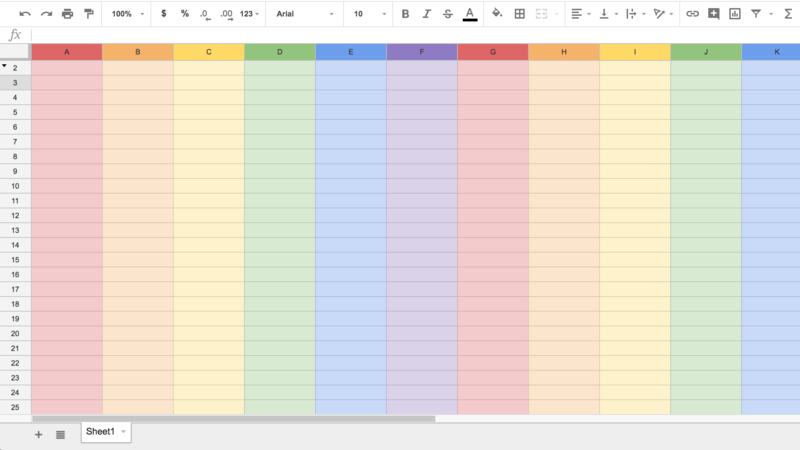 And while Google's latest hidden feature in Sheets isn't quite as complicated as, say, playing Flight Simulator in Excel or firing up the Game of Life in Google Docs (or entering the Konami Code), it's still super-fun and themed around this month's Pride celebrations. To check it out, simply pull up a new spreadsheet in Google Sheets. In cell A1, enter a "p" - the case doesn't matter. Scroll right one cell (B1) and enter an "r". You can probably guess where this is going. Basically, you'll be spelling out pride, one letter per cell, from cells A1 to E1. And as soon as you tap that final "e" and hit Enter (or Return), your entire spreadsheet will turn into a giant rainbow to match the six colours most commonly associated with Pride. Unfortunately, this isn't a permanent paint job. As soon as you delete any letter in the "pride" word you've created, the rainbow goes away. That said, if you just hide row "A", you can keep the colour scheme going while you create a new spreadsheet full of information. And if you need to add columns beyond "Z", where Sheets ends by default, they will all have the rainbow theme applied to them as well.